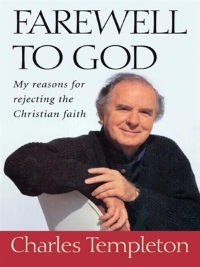 The cover of Charles Templeton’ book Farewell to God. Up to 30,000 people a night would flock to hear Canadian evangelist Charles Templeton1 who, in his heyday, was more famous than his team-mate at the time, Billy Graham. Thousands professed to have found salvation in Christ through Templeton’s preaching. Then things changed. Templeton had long had doubts about the history in Genesis, which is foundational to the entire structure of the Gospel, and how it seemed to contradict the ‘scientific facts’. Logically, ‘millions of years’ meant that the fossils were laid down long before man, hence before sin. But the fossils showed death, bloodshed and disease. So the whole idea of a Fall ruining a once-perfect world, to be redeemed via the ‘last Adam’, Jesus Christ (1 Corinthians 15:46) was meaningless. And no-one seemed to be able to give Templeton answers to his associated questions: How could Noah fit all those animals onto the Ark? Where did the water come from? And more of the very ones dealt with in frontline CMI literature, such as The Creation Answers Book. The reaction from his colleague, Billy Graham, implied that it was ‘unspiritual’ for Templeton to be concerned with such things. Our article2 highlighted his tragic descent into total unbelief, and the eventual writing of his book, Farewell to God: My reasons for rejecting the Christian faith. Some time after our article appeared, Charles Templeton died, after a struggle with Alzheimer’s disease. A Canadian Gospel broadcaster used the occasion to draw a lesson for Christians from his countryman’s ‘fall from grace’. Templeton, he implied, was wrong to ask the questions in the first place. Trying to use commonsense and reason to approach issues of faith was wrong; it was the ‘flesh’ (as he labelled the intellect) at war with the ‘spirit’. Such a confused and Biblically unwarranted response to Bible/science issues still reigns in many conservative Christian circles today. Sadly, it reinforces the secular caricature that Christianity and reality occupy two separate zones. Christian faith is thought to be only ‘in your head’, some emotional crutch that might ‘work for you’, but has nothing to do with hard facts. The Apostle Paul, however, well knew that his faith was based on concrete reality. The Lord Jesus died on a cross and rose again, as a fact of real history (and biology), sharing food with those who saw, touched and spoke with Him after His Resurrection. If that history and biology concerning the ‘last Adam’ was wrong, said Paul, it was not a side issue; Christians would be a miserable lie-believing bunch whose faith was therefore futile (1 Corinthians 15:17). If that which He stated concerning the first Adam (the history of his creation from dust and his Fall into sin ruining the whole creation, and the biology of the deathless world in which he lived originally prior to that Fall) is not really, truly true, we would also be miserable believers in falsehood, because all the hope of the Gospel is based squarely on the truth of its background history. But Paul would have gone on from there to proclaim that the Bible’s history really was true. Creation, the Fall, the Flood—its biology and its geology. The first Adam fell in space, time and history just as surely as the last Adam rose in space, time and history. So if one investigates the past with the right ‘glasses’, the right philosophical axioms (presuppositions) as one’s starting point, the evidence, especially in the ‘big picture’, will be seen to be totally consistent with the Bible’s history. Biblical faith is not an excuse for ignoring the facts; it gives the right basis for understanding and interpreting the facts, which never speak for themselves, anyway. If only those surrounding Charles Templeton had not tried to fob him off with spiritual-sounding platitudes, but had dealt squarely with the real issues he was raising. If only they had shown him how many of the ‘facts’ bothering him were really faith-interpretations that were originally developed on the basis of first rejecting the Bible’s history, and that real science does not conflict with that history. How different things might have been! Not to be confused with John Marks Templeton, the billionaire global financier who bankrolls the theistic evolutionary Templeton Foundation. Return to text. Ham, K. and Byers, S., Slippery slide to unbelief, Creation 22(3):8–13, 2000. Return to text. See also Sarfati, J., Loving God with all your mind: logic and creation, CEN Tech. Journal [now Journal of Creation] 12(2):142–151, 1998. Return to text.